Justice League #3 Review - Snyder Keeps Things Fresh! Justice League #3 Review – Snyder Keeps Things Fresh! Verdict: 3.25 / 5Justice League #3 is integral in setting up the future direction of the series. Just like that, the direction of the rest of the Justice League series has become clear in an instant. This issue is integral in setting up the future direction of the series, moving it on from simply hunting strange forces into something more dangerous for the DC Universe. Having been revealed that there is numerous new multiversal lore to explore, including the still force and the Ultraviolet Lantern corps, I predicted that the series would fall into chasing MacGuffins. However, by following the dastardly plan of Lex Luthor, we are starting to discover there is more at work here. 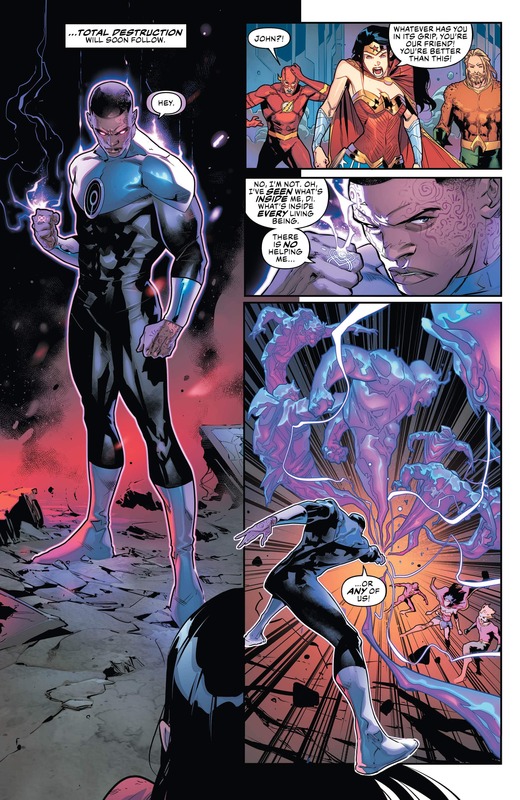 Justice League #3‘s main focus is upon John Stewart after his run-in with the Ultraviolent Lantern corps. Attacking the Justice League, he is eventually subdued by Cyborg, subverting back into his Green Lantern uniform. 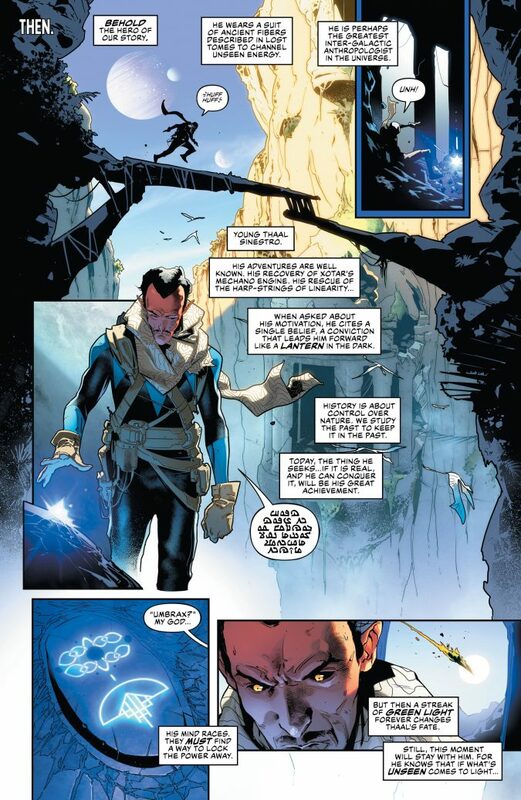 His memories of what this new force is, are tied to Sinestro, who originally discovered its existence, hiding it away from the world. Its return is signifying the changing multiverse, brought on by the source wall issues they have recently been having. The forces, in particular, are tied to a sentient galaxy known as Umbrax; this character being crucial to the finale of the issue. Justice League #3‘s main focus is upon John Stewart after his run-in with the Ultraviolent Lantern corps. Elsewhere we see how Batman, Superman, Hawk Girl and Martian Manhunter are during their process of exploring the new anomaly on Earth. With Lex and the Joker joining this exhibition incognito, the anomaly is revealed to contain guardians, protecting whatever is in there. After having a negative physic connection with one, they start to attack. The plan here for Lex is still very vague and it is unclear what this portion of the narrative has to do with the rest, but we’ll soon see I am sure. The end of this tale reveals that Earth is already in the Umbrax galaxy, becoming part of this sentient beings universe. It is clear that this is possibly why these mysterious forces have been popping up, although how it all links is still unknown, especially to Lex’s plan. However, the series now has a direction, stuck in this weird galaxy, hunting down these forces and working on overthrowing both Lex and Umbrax. Although this is a huge threat very early on for these heroes, it is one that should continue to make this title interesting. The art felt a little off in some places, with focus deliberately straying from where you would most like it to be. One of the guardians looked a bit like Darkseid. Whether this too was deliberate remains to be seen. The writers are stepping up again here though, keeping things fresh. I am hopeful that this series continues to grow, as the threat becomes all the more apparent. Justice League #3 sets up the rest of the series for success, perhaps at the cost of some key character work, however.